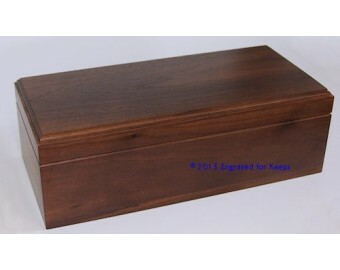 This large felt-lined Made-in-the-USA Keepsake Box is available in both Cherry wood and Dark Walnut wood. It is large enough to store many treasured items. 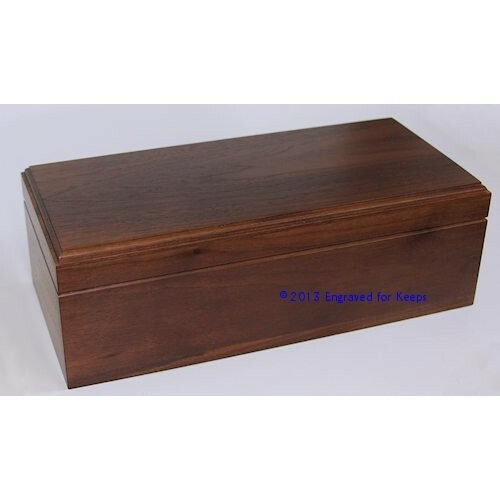 This box is often used for corporate and club awards as well as graduation gifts. A 4.5" x 11" space is available across the whole lid of the box for engraving a name, or a name & dates, or text of your choice. Dimensions 5.5" x 12" x 4" Outside Edges with Inside Edges approximately 4.5" x 11" x 2.25"
Engraving Options Includes personalized engraving with any amount of text that can fit in the 2" x 6" allotted space and your choice of standard font.